The Puri Rath Yatra festival (locally called Ratha Jatra) is based around the worship of Lord Jagannath, a reincarnation of lords Vishnu and Krishna. It commemorates his annual visit to his birthplace, Gundicha Temple, and aunt's home along with his elder brother Balabhadra and sister Subhadra. At the Jagannath Temple in Puri, Odisha. Puri is approximately an hour and a half from capital city Bhubaneshwar. As per the traditional Odia calendar, the Rath Yatra begins on the second day of Shukla Paksha (waxing phase of the moon or bright fortnight) of the Hindu lunar month of Ashadha. In 2019, it commences on July 4 and ends on July 15. Once every nine to 19 years, when the month of Ashadha is followed by another month of Ashadha (known as "double-Ashadha"), a rare and special Nabakalebar ritual takes place. Meaning "new body", Nabakalebara is when the wooden temple idols are replaced with new ones. In the last century, the ritual was performed in 1912, 1931, 1950, 1969, 1977, 1996, and 2015. Since the idols of Lord Jagannath, his elder brother Balabhadra and sister Subhadra are made from wood, they're subject to decay over time and need to be replaced. The new idols are crafted from neem wood. However, not all neem trees are suitable for this purpose. According to the scriptures, the trees need to have certain qualities (such as specific number of branches, color, and location) for each of the idols. On the year when the idols are due to be replaced, a contingent of priests, servants, and carpenters sets out from the Jagannath Temple to find the appropriate neem trees (locally known as Daru Brahma) in a procession called the Banajag Yatra. The priests walk bare-footed to the temple of Goddess Mangala at Kakatpur, around 50 kilometers from Puri. There, the Goddess appears in a dream, and guides the priests as to where the trees can be found. Once the trees are located, they're secretly brought back to the temple in wooden carts, and the new idols are carved by a special team of carpenters. The carving takes place in a special enclosure inside the temple, known as Koili Baikuntha, near the north gate. Lord Krishna is believed to have appeared to Radha in the form of a cuckoo bird there. Every year, the Rath Yatra festival begins with the idols of Lord Jagannath, along with his elder brother Balabhadra and sister Subhadra, being taken out of their abode in the Jagannath Temple. The three of them travel to Gundicha Temple, a few kilometers away. They remain there for seven days before returning via Mausi Maa Temple, the abode of Lord Jagannath's aunt. 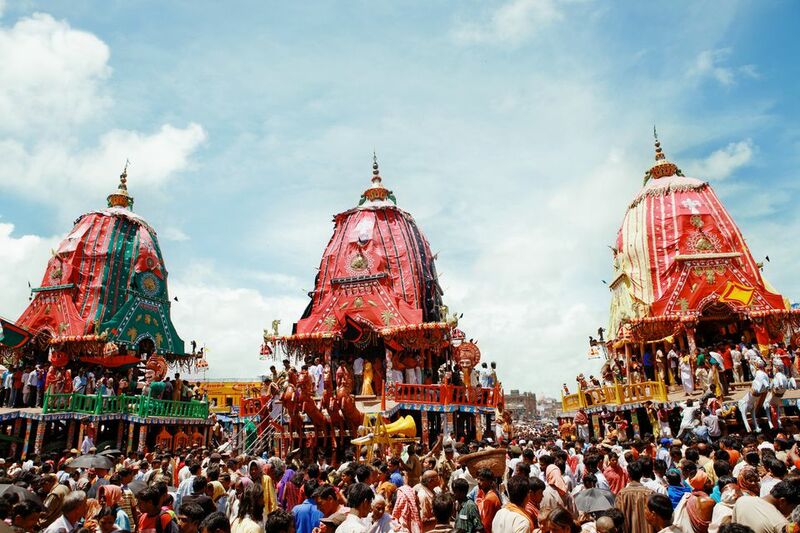 The idols are transported on towering chariots, which have been made to resemble temples, giving the festival its name of Rath Yatra -- the Chariot Festival. Around one million pilgrims usually flock to this colorful event. What Rituals are Performed During the Festival? The creation of new idols and destruction of the old idols symbolizes reincarnation. Devotional songs and prayers from the Vedas are chanted continuously outside the area where the new idols are being carved from the neem wood. Once they're completed, the new idols are carried inside the inner sanctum of the temple and placed facing the old idols. The supreme power (Brahma) is then transferred from the old to the new idols, in a ritual known as Brahma Paribartan (Changing the Soul). This ritual is carried out in privacy. The priest performing the ritual is blindfolded, and his hands and feet are wrapped in thick layers of cloth, so that he can't see or feel the transfer. Once the ritual is complete, the new idols are seated on their throne. The old idols are taken to Koili Baikuntha and buried there in a sacred ceremony before dawn. It's said that if anybody sees this ceremony, apart from the priests who perform it, they will die. As a result, the state government orders a full blackout of lights in Puri on the night the ceremony is performed. Afterwards, the temple rituals recommence as normal. Flowers and new garments are given to the deities, food is offered, and pujas (worship) are performed. Every year, three huge new chariots are made for the idols to be transported on during the festival. It's a very detailed process that takes place in public, at the front of the royal palace near the Jagannath Temple (read about the Rath Yatra chariot construction). Construction always commences on the occasion of Akshaya Tritiya. In 2019, it falls on May 7. About 18 days before the Rath Yatra festival starts, the three idols are given a ceremonial bath with 108 pitchers of water. This is known as Snana Yatra and it takes place on the full moon in the Hindu lunar month of Jyeshtha (known as Jyeshtha Purnima). In 2019, it falls on June 17. It's believed that the deities will get a fever after the bath. Hence, they're kept out of public view until they appear, renewed, on the new moon in Ashadha (known as Ashadha Amavasya). In 2019, it falls on July 2. The occasion is called Navajouban Darshan. The Rath Yatra is a community festival. People don't worship in their houses or fast. When the gods return from their journey, they're decorated and adorned with ornaments of pure gold and given a nourishing drink, before being placed back inside the Jagannath Temple. An entertaining comic scene is enacted for onlookers, as part of the grand finale. Goddess Lakshmi is angry that her husband, Lord Jagannath, has stayed away for so long without inviting or informing her. She closes the doors of the temple on him, locking him out. Finally, he manages to placate her with sweets, and she relents and lets him enter. What A​re the Rath Yatra Ritual Dates for 2019? Sri Gundicha: July 4. Placement of the deities in the chariots and journey to Gundicha Temple. The first chariot to move is that of Lord Balabhadra. Next is Subhadra's, and last Lord Jagannath's. Hera Panchami: July 7. Goddess Lakshmi, the wife of Lord Jagannath, gets concerned because he hasn't come back. Irritated, she goes to Gundicha Temple to find him and see what's going on. Devotees carry the deity in a palanquin to the temple. Bahuda Yatra: July 13. The grand return journey to the Lion's Gate entrance of Jagannath Temple, which takes place on the tenth day of the festival. The chariots are drawn in reverse order. Suna Besha: July 14. Decoration of the deities in gold ornaments. This ritual was introduced during the reign of king Kapilendra Deb in 1430 and is particularly popular. It happens in the evening, with viewing possible from 5 p.m. to 11 p.m.
Adhara Pana: July 15. Offering the deities a healthy support drink. Niladri Bijaya: July 16. Deities are placed back inside Jagannath Temple. What Can Be Expected at the Rath Yatra Festival? The Rath Yatra festival is the only occasion when non-Hindu devotees, who aren't allowed inside the temple, can get their glimpse of the deities. A mere glimpse of Lord Jagannath on the chariot, or even to touch the chariot, is considered to be very auspicious. The massive number of devotees that flock to the festival does pose a safety risk. Lives are often lost in the immense crowd, so extra care should be taken. The idol of Lord Jagannath doesn't have any arms and legs. Do you know why? Apparently, it was carved out of wood by a carpenter after the Lord came to the King in a dream and instructed him to get the idol made. If anyone saw the idol before it was finished, the work would not progress any further. The King became impatient and took a peek, and the idol remains incomplete. Some people say that Jagannath's imperfection expresses the imperfection all around us and that it's a reminder to be kind to those who are different from us.